MetaQuotes is about to release the MetaTrader 5 trading strategy tester ( MetaTester 5 ). One of the big improvements of the new tester is the possibility to create individual calculation frameworks ( agents ) to increase the speed of trading strategies optimization / calculation. On the local computer, each agent represent 1 logical processor core, so for example if you have a quad-core cpu, you can have 4 agents running. The agents can be also installed on remote computers in your local network or other Internet-connected computers around the world. This means that you can create a distributed computing (grid computing) project with as much cpu power as you want. This concept is similar to the popular SETI@home or Folding@Home projects. 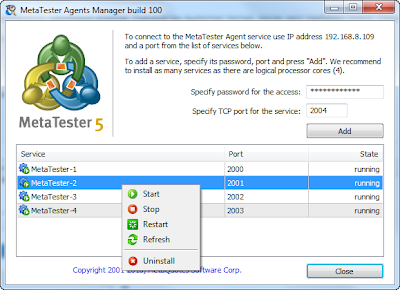 The installation of (remote) agents is very simple, according to information from MetaQuotes, all you need is to use MetaTester.exe (a single file, nothing else is required) and install agents as services according to the number of cores or one by one. A separate access password is set for each agent, to ensure that only authorized users connect to it. The client terminal on the central computer plays a manager role and coordinates all the (remote) agents. Each agent opens one local TCP port and waits for connection from the manager client terminal. You can configure all the connections in your router/firewall if it's necessary. The connections will be encrypted and protected by password to ensure maximum security. Once you have everything configured, the entire system will operate in automatic mode. If an agent will interrupt his work, his task will be transferred to the next available agent. The new Metatrader 5 strategy tester will be much faster than in MT4 because the tester will function as a standalone application. Also, there will be a x64 version of the Metatrader 5 terminal & tester and the MQL5 code will be automatically compiled to native x64 code with access to all available memory. This means that you can use computers with dozens of gigabytes of memory. However, the strategy tester does not support Nvidia CUDA platforms because they are slow in processing of general purpose algorithms, and this is any program on MQL5. Instead of CUDA, every cpu that uses SSE2 (Pentium 4 or higher) is supported. MetaQuotes will also launch a service on the MQL5 community website where computer power for remote agents will be sold. Everyone will be able to sell it, for example, you can sell your quad core cpu power from 1 to 6 AM. You can also buy the computer power direct form the MQL5 website. For it's services, MetaQuotes will take a small fee from the money which go to the seller. * The agent program is also good protected from disassembly or modification. According to MetaQuotes, the Metatrader 5 strategy tester will be soon available. Probably March/April 2010. Cool, a 64bit version of metatrader 5. But even with access to all available memory, does it even uses it? I remember metatrader loads heavily on CPU instead of memory.